Parrots make a wide variety of sounds, keeping themselves - and you - entertained for hours. But not all the sounds your intelligent pet makes will be pleasing to the ear… or to the parrot itself. 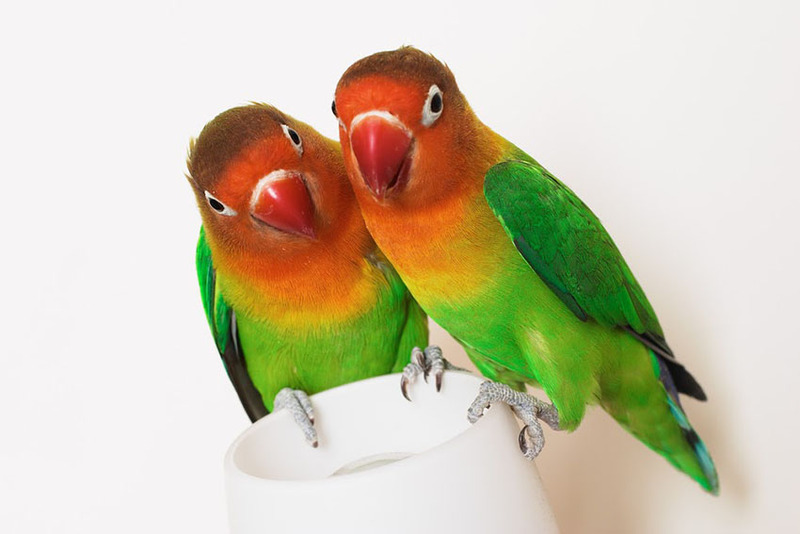 The guide that follows describes some of the broad categories of sound your pet birds will make. Not to be confused with contented beak-grinding, beak clicking is when the parrot rapidly rattles the upper and lower parts of its beak together. It is meant as a threat. The parrot will usually be defending his personal space or territory, or his mate (avian or human!) The sound is usually accompanied by dilated pupils, a sign of excitement. He may also raise his feathers and or/wings so that he appears larger in the eyes of his rivals. This is a sign of contentment, regardless of the fact that it’s a cross between someone grinding their teeth and scrunching up an empty packet of crisps. 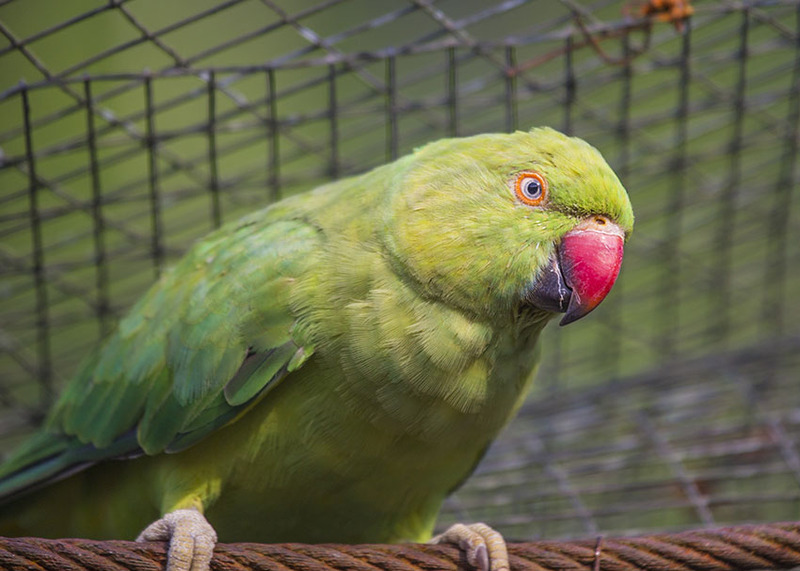 Parrots usually make this noise in the evening as they prepare to settle down, or as a general backdrop to a reassuring chatter of familiar sounds beyond the cage, perch or aviary. This is the general background ‘motor-mouth’ sound your parrot makes when he’s happily going about his business. You’ll get to know the bird’s individual sounds and vocal quirks, and it’s always interesting to see what words, whistles and background noises he adds to his repertoire. A Lilac-Crowned Amazon with lots to say! This is a sound of aggression or warning. The parrot is telling you to stop what you’re doing, or keep away. In larger birds it will be a low, guttural growl; in smaller species it will be much higher, but still unmistakably angry! The growling parrot is stressed and will usually bite anyone who comes too close. The neck and other feathers will often be raised, and the pupils dilated. This is a sound some parrots pick up from humans, and they usually take advantage of the fact that their human companions enjoy the sound. Their gleeful use of the sound - often at inappropriate moments, such as when being scolded for bad behaviour - is a source of great pleasure for parrot-keepers. The birds learn to recognise the the pitch and tone of voice that precedes a laugh, and can therefore ‘pre-empt’ laughter by getting there before you do! 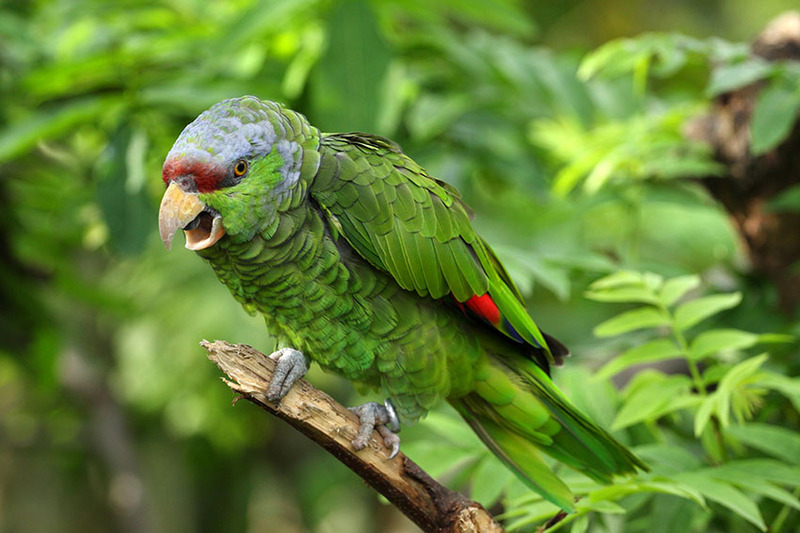 If a parrot laughs when it has bitten someone, or another bird, it may be the result of an onlooker finding the biting bird very funny during the training period, and should not be encouraged with further laughter from you. What it doesn’t mean is that your bird is evil… although in a creature so intelligent, you can never rule out the symptoms of a wicked sense of humour! Moluccan Cockatoo - master of the well-timed laugh! Prolonged silence usually means the bird is asleep or tired, or is tackling boredom through drowsiness. Some parrots may be very quiet if preoccupied with something engrossing (such as feeding, chewing, or hiding something). 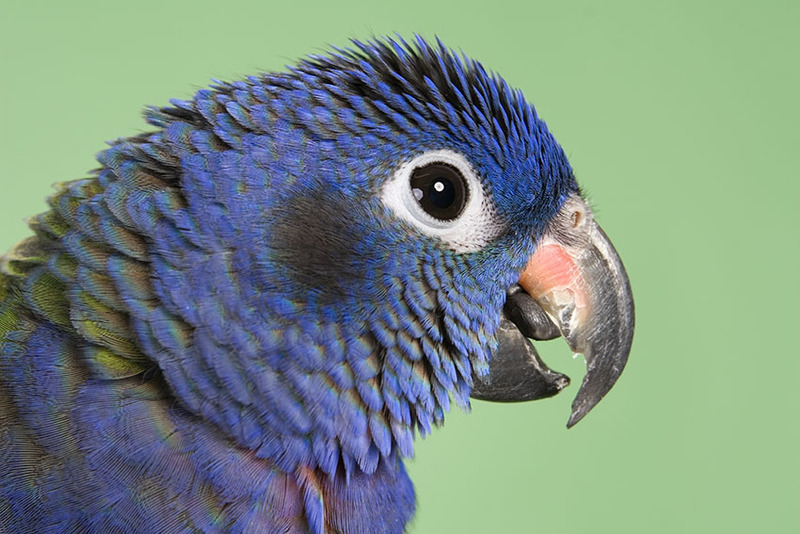 It can also be an indicator of illness – if your bird is usually noisy, it’s worth taking a good look at him to make sure he’s not looking poorly (see the Parrots and Disease section of this guide). If you didn’t know better you’d think a parrot purr was a close cousin to growling; but purring is a sound of happiness, just as it is in cats. It is lower, and less vocal than the growl (again, a bit like a cat purr). If you’re struggling to tell a growl from a purr, the parrot’s body language will furnish you with the clues. Purring birds look relaxed – i.e. no raised feather and dilated pupils. Ring-Necked Parakeet - a purr is much better than a scream! This is an alarm call, meant to warn all other parrot for miles around that the end is nigh! It is often inspired by a creature or object that the parrot is convinced is life-threatening, from a bird of prey in the sky to a loathed household appliance such as a vacuum cleaner. Or it might be due to a new sight or sound, something that has scared the parrot. African Greys have another version of the shriek, a particularly loud growl. It means the same thing. Parrots sing when they are happy, just like a human in the shower. The song is an ever-changing mixture of the bird’s favourite sounds, from gurgles and trills to whistles and squawks. Some parrot species are more musical than others, and many are the bird version of tone-deaf. They will happily join in with background music or conversation, and some (the macaws are often guilty of this) seem to take wicked pleasure in singing off-key. 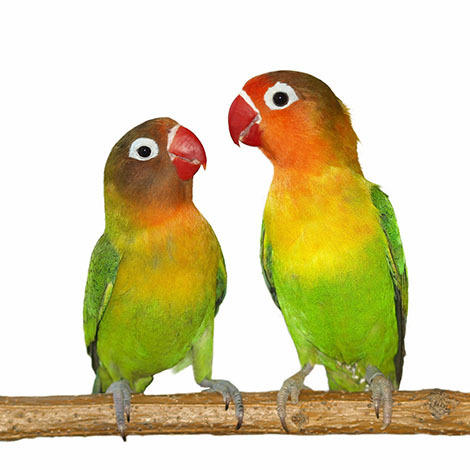 Lovebirds have a lovely musical chatter, and a high-pitched squawk too! This is sometimes a sign of boredom and low-level anger. It generally shakes things up, as the other birds become restless, and the human owner tends to intervene with attempts at reassurance or ill-concealed anger! Try to end the squawks with a new treat or toy rather than lots of cooing and attention, or the parrot might well become an ever-squawking attention seeker – something no one wants! It’s never a good dea to shout at the birds either, as this will only put everyone on edge, and may simply inspire even more squawking. This is an extended version of ‘chatter’ (see above). If a parrot has learned human words and sounds, he will only utter them when he’s feeling happy, relaxed and/or inquisitive. Being clever animals, they soon learn that these sounds please those strange, wingless, featherless giant parrots on the other side of the cage/aviary, and will often use a favourite word, phrase or whistle to get your attention. 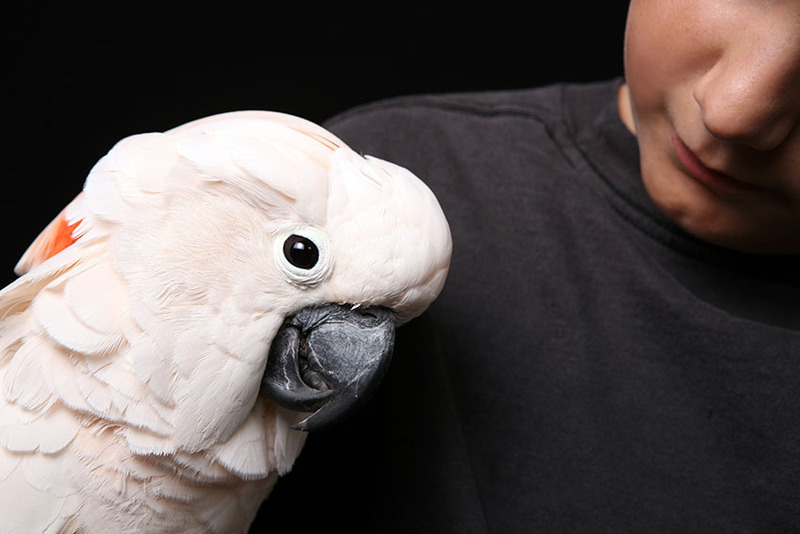 (For a more in-depth look at talking parrots, see the Teaching Parrots to Talk section of this guide). This sounds like a human clicking his or her tongue on the roof of the mouth. It means the parrot is happy and seeking attention. Not all parrots make the sound, and it’s most commonly associated with cockatoos and cockatiels. A parrot never whistles in anger. It is a happy sound, or one meant to gain your attention. Cockatiels are great whistlers, and many other species such as Cockatoos and African Greys often have a favourite whistle (sometimes learned from wolf-whistling humans). The whistle sometimes becomes a form of comment, given if someone enters or leaves or room, or if a car passes by the window, for example. Birds also grind their beaks to trim it... right?